The innocent never waver from doing what’s right, even if it means drowning the world in fire. Violina had been burned and betrayed by mankind ever since she sprang into existence. They named her a heretic and condemned her to a pit to live and die in agony. Though she sat stranded, starved and bloodied, she would not submit. Violina, the girl who had been mocked and hunted for rejecting the warped ideals of artificial authority, would lay down her own law. 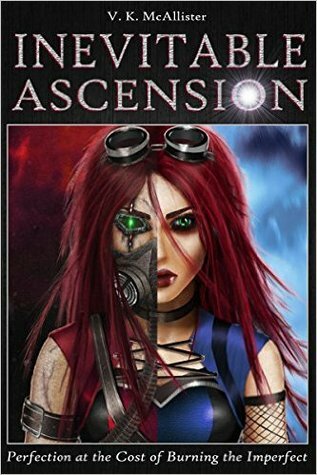 Inevitable Ascension — The rapid-fire action/adventure novel packed with a host of twists that will make your mind explode! But not literally, otherwise that would be really gross. First of all, oh my gosh so much action! I love fast-paced, action-packed books more than any other books ever. Normally I complain that there wasn't enough action but I cannot say that about this book, at all. While that was an awesome thing and definitely made me love it, it made it kind of hard to get to know that characters. That doesn't mean I didn't like the characters, though, in fact, I liked them a lot. I really liked their dialogue too, it was just so sassy. I think it's cool that the authors are a husband and wife duo that wrote together. I don't think I would have the patience to write a letter with my husband much less an entire book. Anytime, there is a duo writing a book I alway worry about it not joining well but it definitely worked with this book. Kudos, to these authors for making something like this work because I'm sure it was difficult. There were a few times that I got hella confused with what the hell was going on. I think it was due to having so much going on at one time. I felt like I was just thrown into the mix and was scrambling to make sense of everything.